There are literally endless ways to mix and match decorative pillows. That's a fact. And that exact fact is what makes it so overwhelming and hard to pull through. This trick that I'm about to share with you today is meant to make things a little easier. Consider it more as a hack than as a design guidance, as, like I mentioned before, there are so many ways to do the mixing and probably not one of them is wrong. Actually, I don't believe in right and wrong as long as the result is something you are comfortable with and speaks to your heart. TEXTURE: Think velvet, hide, woven, knitted, fur or anything that gives volume, sheen or an interesting touch in a way or another. I'm picking mostly monochromatic pillows in this category to let the texture pop out and keep things fairly simple. PATTERN: Since we want to keep things easy to follow I'm just using two categories of patterns in the mix; the large scale and the small scale. Keep in mind that scale is something relative and has to do with how the two patterns work together. A small scale in one case can be the large scale in another and vice versa. The distinction is only happening so as to help you put together two different patterns and make them work. Similar patterns, like stripes or florals, are a more obvious match but that shouldn't keep you from being bolder and try new things out. Same thing goes for the color palette. A consistent palette is almost always a success, mixing and matching colors needs a more trained eye but then again, that's something you should definitely try out if you feel like it. As you will see in the diagram that follows, I kept color schemes to a minimum number of complementary hues since this post is all about mixing and matching pillows the easy way, right? LUMBAR: Aha. Now, this pillow is more like a guest start. A pillow to give the finishing touch and complete the look. It can be of any of the categories above, just what feels is missing from the pillows mixing. Its longer rectangular shape will diversify it from the rest of the picks and will create an extra visual interest. 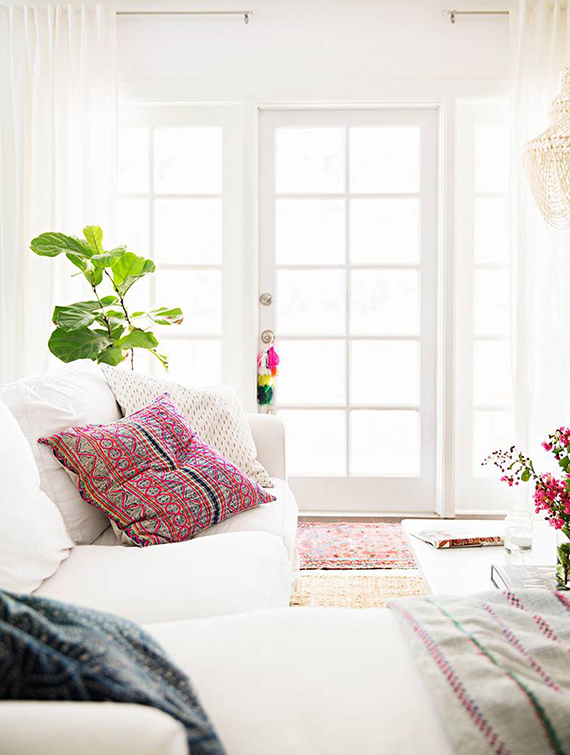 6 comments on "A simple way to mix and match throw pillows"
Lovely post Eleni, thank you! I love this! I don't know why but I always struggle with mixing and matching pillows....until now, that is! Love, love, love this! Thank you for this post!